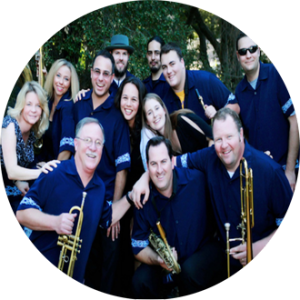 Blue Latitude is a Ventura R&B band available for weddings, parties, and other occasions in Ventura and surrounding areas. Their repertoire includes songs such as Expressway to Your Heart by the Soul Survivors, I Wish and Signed, Sealed, Delivered by Stevie Wonder, and Shining Star by Earth, Wind, and Fire. There are 13 band members and the lineup includes Stacey Boccali on lead vocals, Leigh Vance & Nanette Hutchison on lead and backing vocals, Mario Boccali on piano, organ, and vocals, Max Gualitierri on guitar, Brad Vance on bass, Nick Boccali on drums, Tom Kiddie & Greg Kiddie on trumpets, Charles Ortega on tenor sax, Chad Pluckrose on tenor sax and vocals, Kristine Ellison on bari sax, and Will Von Protz on trumpet and trombone.